Wooden Boat festival 2011, a photo by Southworth Sailor on Flickr. 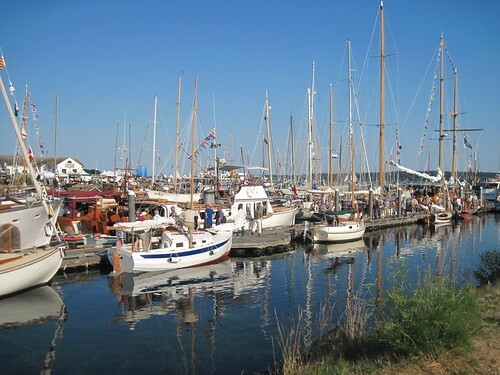 Every couple of years I like to attend the annual Wooden Boat Festival in Port Townsend. This weekend provided a great opportunity, so Esther and I went up to PT on Saturday. She got to take her time shopping in town while I soaked in the festival. I admire the warmth and beauty of wooden boats and sometimes consider building one, but I doubt whether I have the patience and time to pull it off. Many boats are started, but few are finished. Several of my favorites were there and it was fun talking to the owner/builders who obviously had a lot of pride in their craft. I was fortunate to talk to a world famous sailing adventurer about a new boat called a 'Scamp' and listen to one of my favorite boat designers from New Zealand. The weather of course made the experience additionally enjoyable. All that looking at boats yesterday gave me the sailing itch, so I took my boat out this afternoon. The wind died on me, but I was treated by a pair of of orca whales that passed by me at about 150 yards from my boat. FortunateIy no motorboats were following them and they disappeared after a few minutes. I checked the internet when I got home to see if others had reported sightings and it was confirmed by other reports from ferries and sightings from land.